in fact, the only reason i'm blogging right now is to pass the next few minutes til i can drop the lil hellians off at my parents. i'm sorry, but after two days of being stuck in the house with them--they are making me craaaaaaaaazy. like, whoa-crazy. like, the three of us were sitting on the couch together and those sweet little girls were annoying me so much, i got up and moved across the room so i didn't have to sit by them. isn't that awful?! needless to say, i'm ready for a quick break. even though i wear all of these components on a regular basis, i've never worn them in this combination. i suppose that's the point of the remix challenge, huh? anyway, i kinda like it, but the whole belt-adjusting thing will probably prevent me from wearing this ever again. oh well, ya win some ya lose some. and now i'm ready to lose some. kids, that is. post-edit: i was looking over this post & decided that picture above is pretty bad. the color is weird because i had to use a flash. anyway, here are a few more that piper actually took. i think her photog skills are getting better! You look great! Have fun, you deserve it. And isn't it funny that once you get a break from them, you'll come home and some how their lil devil horns will have disappeared and they will suddenly be cute again! I know the feeling well (3kids). Sorry about the barfing! I love that you belted the scarf. What a fun idea. Hope you had a good night out! You sure have a cute outfit on despite it all! Love the denim shirt, makes me want to dust mine off and give it a try! It's totally ridiculous that the sun goes down at 4:30 right now, I feel like I never see sunshine at all anymore. I love how you belted your scarf with your blouse, such a good idea. I think you look amazing. I love the idea of belting a long scarf--Awesome! 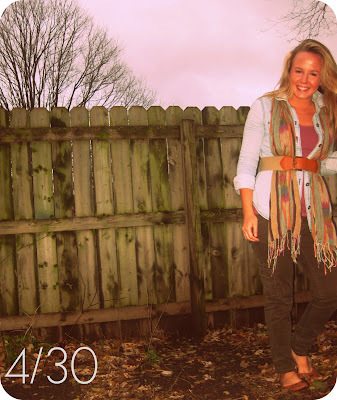 I love the belted scarf & your hair looks really pretty! Hi, fellow remixer here. Sounds like you've had some challenges on top of challenges this week. The belted scarf is beautiful. Enjoy your girls night out.